This beer marks the one third of the way through this challenge. 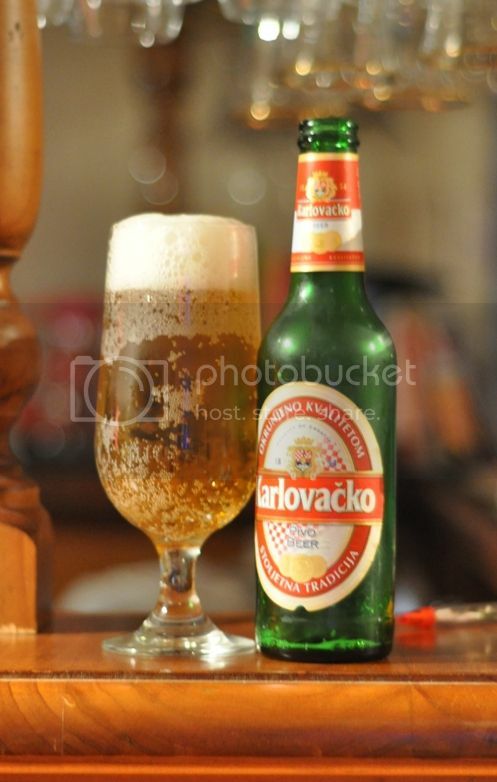 Karlovacko is made in Croatia and has a bit of a reputation, this beer won a Gold medal at the World Brewing Industry awards in 2005. That is a big reputation to live up to. This has really peaked my interest and hopefully it is just a nice refreshing pilsner. Ok, the pour is absolutely magnificent. Massive white head with lots of air bubbles on top of a golden coloured liquid. Heaps of bubbles line the glass and are still rising to join the head. The head retention is excellent and it rims the glass nicely for the entirety of consumption. I don't think there is a much better looking pilsner, it's pretty close to perfect! The odour is nice and clean, it has a very fruity nose and also has sour notes, almost like a cider. There are some slightly sweet malts up front but this is replaced by an excellent herbal noble hops character. The hops smell incredibly high quality, but there don't appear to be enough of them. Karlovacko doesn't have a huge ammount of smell to it but most importantly there isn't anything nasty about this beer. It doesn't necessarily smell inviting but it is not offensive most importantly. I really enjoyed this beer instantly, this was exactly what I needed after a day that seemed to never end! The beer has a tart flavour with fantastic hoppy bitterness. There are elements of fruit in there as well but the hops are almost overpowering, they really are spectacular! This is a really excellent pilsner and I love the light dry finish that this beer leaves in your mouth. It's quite different to many other Pilsner's with quite a big emphasis on the bitterness of this beer, I really like it! Now I'm not saying this is the world's best beer but I am saying that it was perfect for what I needed today. It's a really good thirst quenching beer! This pilsner is definitely Czech inspired due to the complex hop flavours, and really has the bitterness of a proper pilsner. It's actually very refreshing! I can't fault this beer tonight and I will definitely be buying more for summer. I would recommend this beer to anyone needing a refreshing beer over summer, it probably isn't that well suited to winter though. I hope this made sense tonight as I'm just buggered.